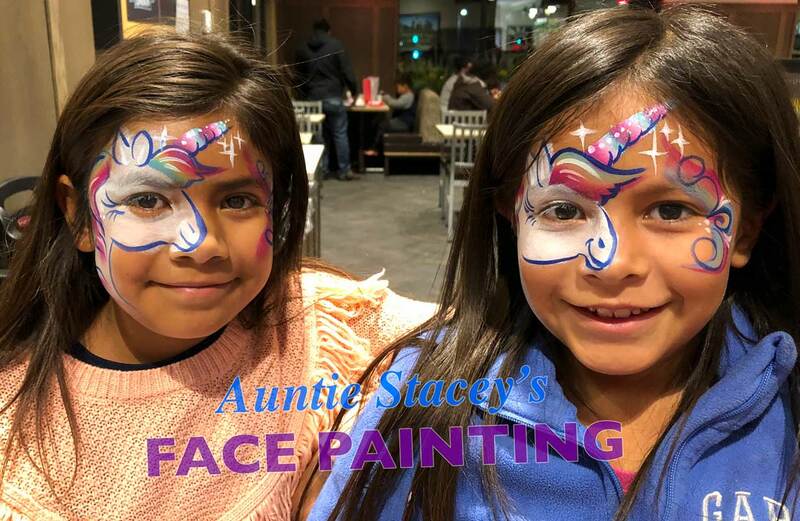 Auntie Stacey's Face Painting | SF Bay Area face painting, balloon twisting and more! Welcome to my website! I’m a face painter from Sonoma County, California. 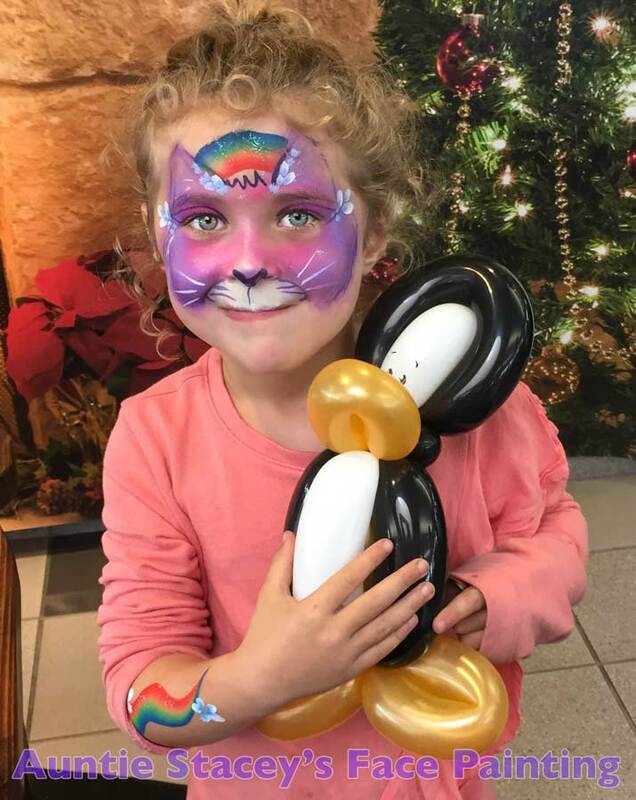 I travel all over the San Francisco Bay Area painting fun and twisting balloons at birthday and holiday parties, corporate events and fairs. I use cosmetic grade non-toxic “paint” that’s safe for all faces. Actually, it’s specially formulated, cosmetic grade, water based make-up which comes off easily with soap and water. Wolfe Brothers and Kryolan are two of my favorite brands. I also offer a “Glitter Bar,” featuring glitter tattoos (which last for 3-7 days), gems, festival glitter and lots of eye bling. Great for teens, adults, bar and bat mitzvahs. I’m fastidious about cleanliness, and very careful not to paint near the eyes of wiggly children. I use disposable applicators for lip color. Always sensitive to the youngster’s needs, I simplify designs if there’s a long line of kids waiting and take more time for details if there isn’t. I’ve been painting for a long time so I can paint quickly, while still maintaining the “wow” factor. “We received so many amazing compliments. Your hospitality and creativity definitely added to the success of our event,” – Keynan Burnett, Consumer Direct Coordinator, Frog’s Leap. 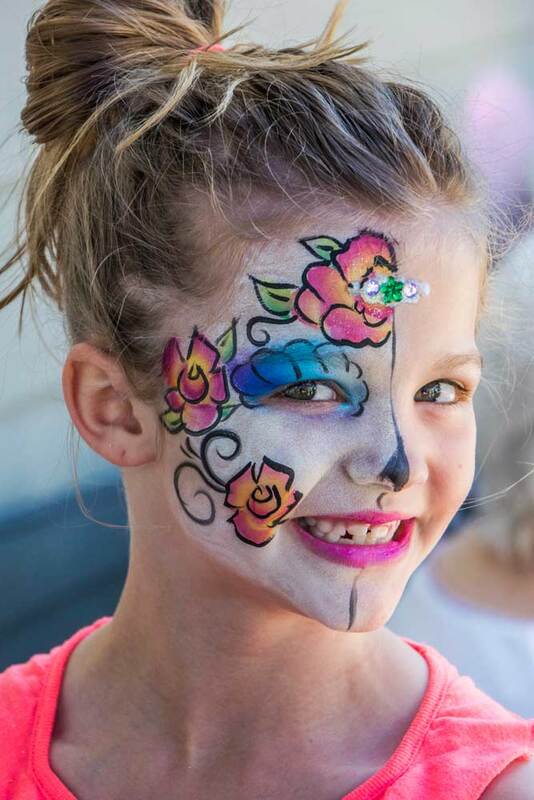 Kids of all ages can choose between full face art, or something smaller on their face, cheek or arm. Ask about adding games to your event. Perfect for corporate parties, birthday & holiday events. Hablo un poco de español. Et un peu de français aussi. See Yelp for my five star reviews. Marin Osher JCC, San Rafael. “Like” my facebook page for specials and to find out about free events. © 2019 Auntie Stacey Dennick, all rights reserved. Please do not copy without written permission.